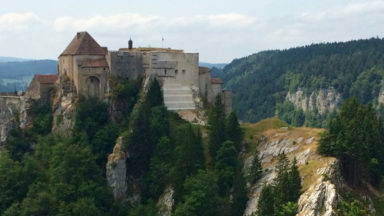 When the time came to update their Cicerone guide, Les and Elizabeth Smith were happy to have an excuse to revisit the Vosges and Jura. This section of the GR5 winds down through the villages and vineyards of Alsace, crossing the hilltops of the Vosges, before threading along the Doubs gorge and climbing onto the plateau of the Jura. An alternative approach to this section of the GR5, down the GR53, extends the walk to take in the whole length of the Vosges. 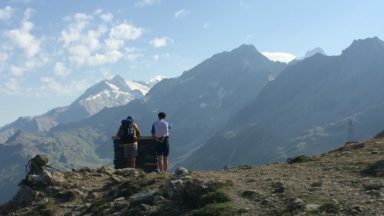 Walking across Europe along the GR5 trail is a tempting goal for many long-distance trekkers, but the focus is often on the final section, crossing the Alps. The previous stretch, down through Eastern France, is glossed over, and that’s a pity. 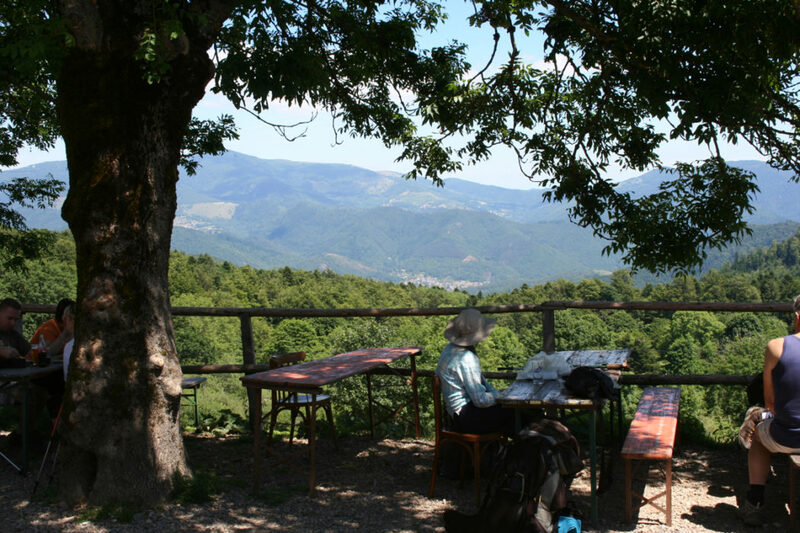 We have returned to this region again and again over the years, and have recently been back to update our GR5/GR53 guidebook. For the walker, a journey down through these borderlands of France can be fascinating; it’s certainly not just a footpath leading to the Alps. The GR5 climbs into the Vosges near the little town of Schirmeck, but this route actually misses some rather special places just to the north. 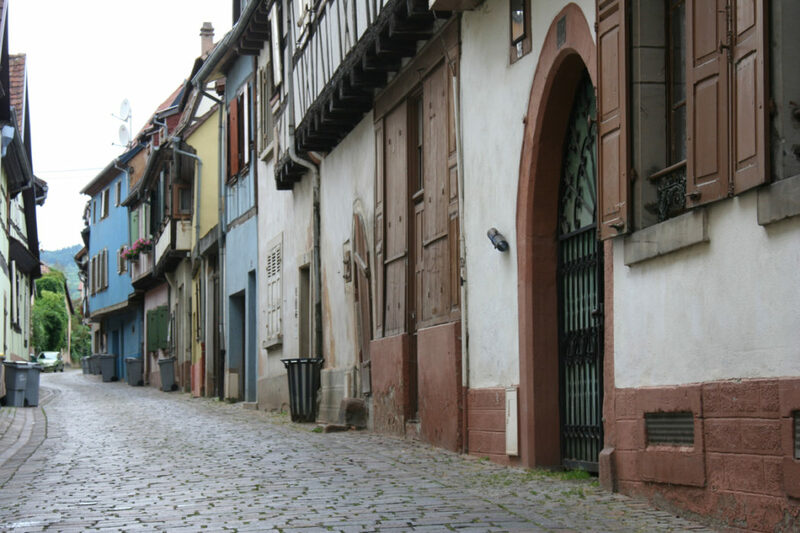 The Northern Vosges lie in the topmost corner of France, hemmed in by the German border. Evidence of previous conflict is not hard to find; there can’t be many places in Europe where such a concentration of castle ruins is crammed into such a small area. A few sites, such as Fleckenstein, have been developed as tourist attractions, but many more are deserted. Explore them at your peril; a few are now off-limits because of their obviously hazardous condition. The GR53 is the classic path through this region, starting at Wissembourg in the far north-east, and linking to Schirmeck, which is eight days’ walking for us. 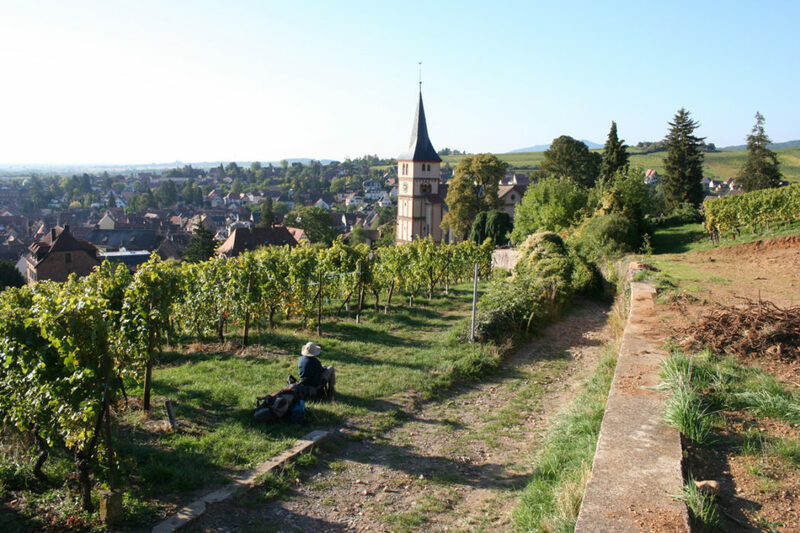 The main GR5 heads south from Schirmeck, and within days reaches the first of a succession of little ‘edge of the Alsace plain’ towns – Barr, Châtenois and, our favourite, Ribeauvillé. While the German border may be some 20km away across the Rhine, there is something very Germanic about the half-timbered old buildings, often surrounded by vineyards. The distinct German edge to the culture is also seen in the local fondness for beer, cabbage and sausages. This is border country, for sure. The whole region was part of Germany from the end of the Franco-Prussian War (1871) until 1918, and a local Germanic language (Elsässisch) is still alive and well. 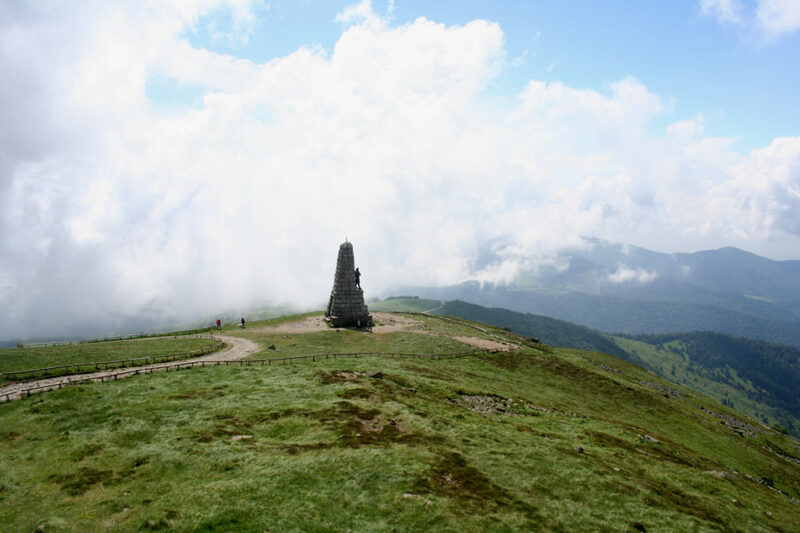 The Vosges in general is a wooded landscape, but the GR5 route leads up through the forests to the open hill pastures, the hautes chaumes, where you might spot chamois, and are almost certain to see the local spotty Vosgienne cows, the ultimate source of milk for some of the famous local cheeses. Regarding the practicalities of walking here, a bit of planning ahead is beneficial. In the past, we used campsites whenever we could, and refuges or gîtes in the hills. Recently we have become more flexible and have used a range of accommodation depending on location from a B&B in a vast, old timber-framed house in Andlau, to a night in the somewhat quirky Chalet-Hôtel du Grand Ballon, near to the highest point of the Vosges. Frontiers can be conflict zones in wartime, as seen in the Vosges in 1914. The evidence is still there in the landscape, where the GR5 crosses the old front lines at Tête des Faux. While the trenches and dugouts here are overgrown and dangerous, further along the trail at Hartmannswillerkopf these old battle lines are better preserved and more accessible, and we took time out from walking the route to explore the waymarked paths that now weave through the old trench systems. 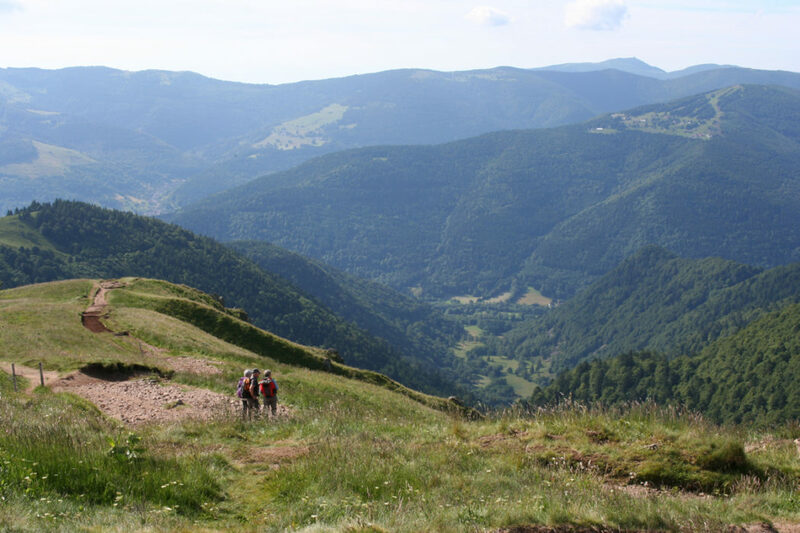 Beyond Thann, the final few days’ walking in the Vosges leads across more remote country towards the Ballon d’Alsace. Ten years ago we stopped for refreshments at a little farm in the hills. The old lady spoke to us in German, and we enjoyed coffees sitting outside on the terrace, with chickens pecking at our boots. The whole place looked rather run-down, and we speculated that a little farm in the hills, romantic as it seemed, might be a bit marginal in today's world of agribusinesses, and what about the long, snow-bound winters? As we approached for a second visit, last year, we couldn’t help wondering what had become of the place. We need not have worried. Belacker is thriving – a proper café – with menu board no less. It now serves a whole row of tables on the terrace, and a refurbished building provides overnight accommodation for walkers. The chickens still peck your boots, though. 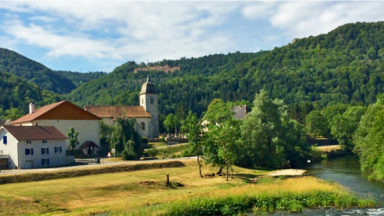 The link between the Vosges and the Jura passes through a more populated, flatter landscape, following a canal for some of the way. For us, this section will always remind us of our first trek along the route. As often happens on a long-distance walk, we had casually got to know a group of fellow walkers, in this case three French chaps, also heading down the GR5. It was an exceptionally hot September, and their talk was of ‘la canicule’, a late summer heatwave. 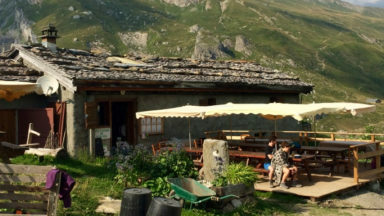 They assured us that there was really no problem, as we could all look forward to a refreshing cold drink at the hotel in Chamesol, a few miles ahead. Unfortunately, we arrived to find that the hotel was closed for the day. We turned away, somewhat disappointed, ready to walk on, but our French friends had other ideas. After conferring together, they ignored the 'fermé' sign and hammered on the door until some poor staff member opened up. We did not keep up with the rapid French that was exchanged on the doorstep, except there was some mention of ‘and our friends here have come all the way from Scotland…’. Perhaps the honour of France was now at stake, because we were all ushered inside and served lemonades before continuing to St-Hippolyte. 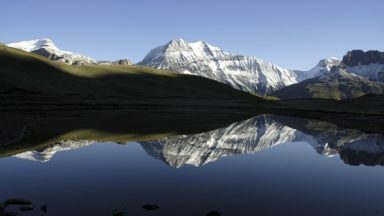 Further south, the GR5 enters the Jura, and is soon running close to the border with Switzerland. At points, it follows alongside the old border stones, and then briefly loops across onto the Swiss side. The two-day walking stretch from Goumois to Villers-le-Lac provides some of the best ‘border walking’ of the whole trip. The frontier here is defined by the rushing River Doubs, in places deeply incised in a rocky gorge. Switzerland may be within hailing distance, but it can be reached only by occasional bridges and barrages. The isolating effect of the steep gorge walls gives a feeling of being wonderfully detached from the outside world. 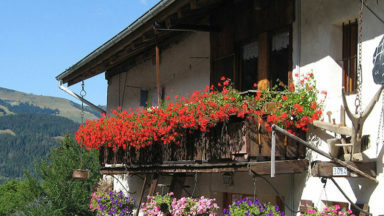 For accommodation in the gorge, you might opt to stay in the uniquely sited hotel ‘La Rasse’, unique because the building sits firmly on the French side of the river, but the only road access is across a small bridge into Switzerland. I wonder whether the French post van really drives through a bit of Switzerland just to deliver the letters? This difficult terrain was used to advantage by smugglers, who passed back and forth with contraband, climbing up from the river using rickety ladders. Up on the plateau, waymarked routes, the Chemins de la Contrebande, criss-cross the landscape where local lore has it these smuggling routes once passed. You may also pass the Cabane des Douaniers, a little wooden shelter named after their great adversaries, the excisemen. Now the nearby frontier with Switzerland gives a different kind of opportunity as people can drive across daily to work. There is also a reverse flow as the Swiss cross into France for cheaper shopping. The Jura is a thinly populated region of extensive forests and isolated old farms, and earning a living from the land has never been easy. Making some profit from tourism is now a useful bonus, and we were made very welcome one night in a traditional old farm building, with a huge fireplace and sturdy wooden furniture that looked as if it had served for generations. 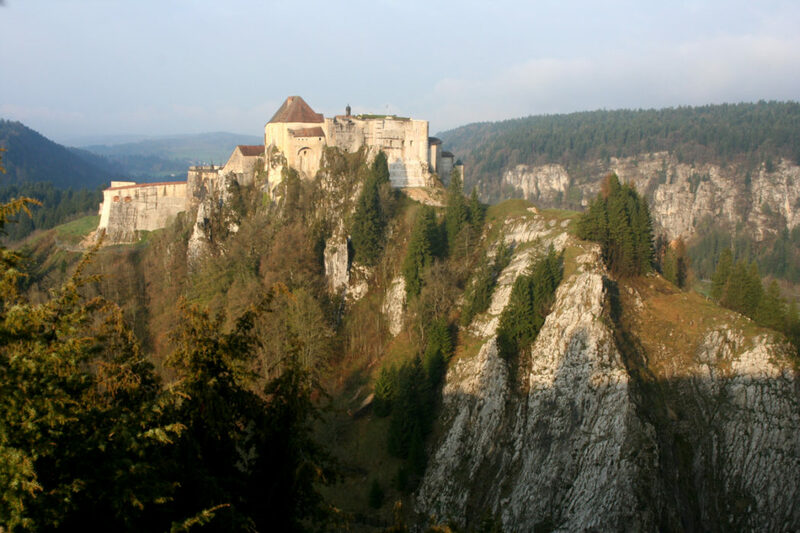 Compared with the Vosges, castles are not a major feature in the Jura, but the one you do pass at Joux is certainly dramatic. 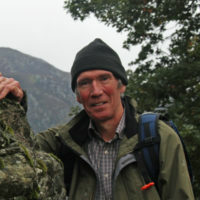 Perched on a rocky crag, guarding a pass, it provides a reminder of times when foreign visitors were not so welcome. Another exceptional vantage point is reached when the GR5 leads along the edge of the cliffs at Mont d’Or, with views extending over Switzerland. Towards Mont d’Or, ski developments creep into the landscape, but there are still plenty of facilities open when the snow has gone and walking is easier. Finally, the GR5 crosses into Switzerland to begin its descent to Lac Léman. The little town of La Cure is split between the two countries with a border post on the main road through the middle, not that it is always manned. Even some buildings are divided, the Hotel Arbez Franco-Suisse has a front door in France and a back door in Switzerland, and in one bedroom a double bed has one side in each country. 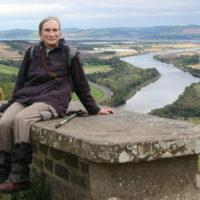 Our experience is that the GR5 walk across Europe is a rewarding undertaking, and for intrepid trekkers taking on the whole journey, the variety to be found in this central section makes it a really interesting part of the trip. For those who can’t spare the time to do the complete route, you can certainly get a taste of it in the Vosges and Jura.